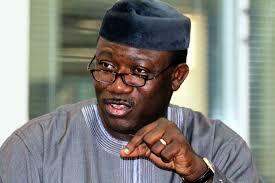 Nigeria’s Minister of Solid Minerals Development Kayode Fayemi will on Thursday address the United Kingdom Parliamentarians in Westminster, London on Nigeria’s diversification agenda. A statement by Mr. Olayinka Oyebode, the Special Assistant on Media to the Minister of Solid Minerals Development on Tuesday in Abuja, said that the invitation was sent to the minister by All Party Parliamentary Group (APPG) in UK to address the Parliament on “Nigeria’s Solid Minerals Sector: Alternative Investment Opportunities. According to the statement, the meeting will afford the minister the opportunity to discuss investment opportunities in the Nigerian minerals sector with the parliamentarians, policy makers and business executives. It said that the invitation would bring together British Parliamentarians, Diaspora Stakeholders, policy-makers, business representatives, diplomats, civil society representatives, media, academics and other experts in the sector. “The minister will share his views to transform Nigeria’s solid minerals sector, the value of the sector for Nigeria as the country seeks to diversify from oil and the opportunities for investment. “The APPG on Nigeria is an independent and impartial cross-party group of British parliamentarians, which seeks to strengthen the bilateral relationship between the UK and Nigeria,” it said. It also aims at raising the profile of Nigeria in the British Parliament and support development and democracy.